Like many entrepreneurs these days, I share my professional brand and parts of my personal life online using various social media platforms. While my main focus online is to curate the most relevant tech information , I also consider myself a fashionista who has found stylish heels that can make it through a week at Consumer Electronics Show (fashion), clueless in the kitchen and always looking for easy recipes (food) and a number one fan of her twin sons’ Little League baseball team (sports). But I do wonder what a snapshot of my digital life would look like. That is why I was excited to try a tool created by Intel called “What About Me?”. The tool captured a snapshot of my social media life in an infographic to represent the topics and updates I share. Step 2: Wait until it processes – and run a mouse over the circles to have some fun while waiting. Next, click on the results and see your digital life. 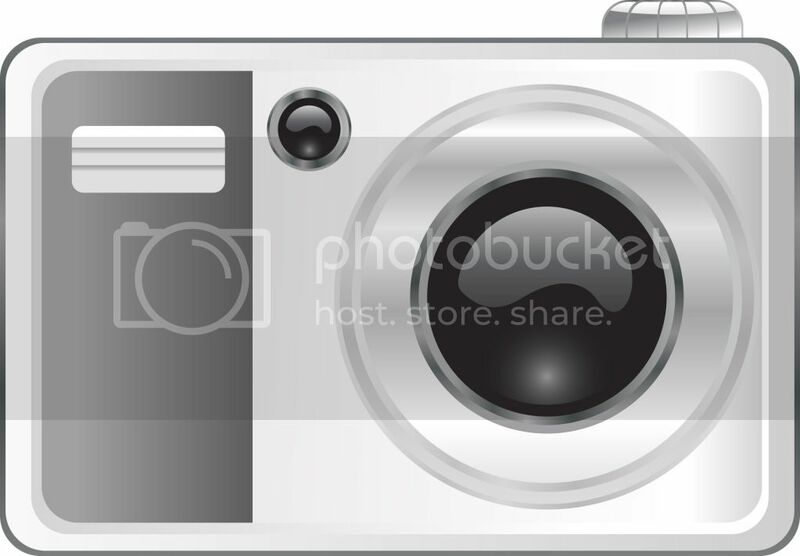 There image has different areas that cover the topics, stories, popular updates, pictures, mood, connections and when you clock in. The areas represent different types of updates – but it mainly covers Facebook. There are also buttons to share the results on Facebook, Twitter, Tumblr and Google+ and save as an image. What shocked me about my results? Here is a video where I talk about my “What About Me” tool results – please share yours! Update 5/18: party concluded on May 17 7pm pst. Winners were announced on Twitter: $50 Best Buy gift cards went to @simplyandreah , @immortalb4 , @helyn4, @littlecrunchy and @paramedic_mom. $250 Best Buy gift card to @thattweetthing. Please join co-hosts @IntelEdge @LittleTechGirl @TechMama as well as panelists @TechSavvyMama @Tech4Moms @scrappinmichele and @c2cmom for a Twitter Party where we share our results and discuss how we use social media. 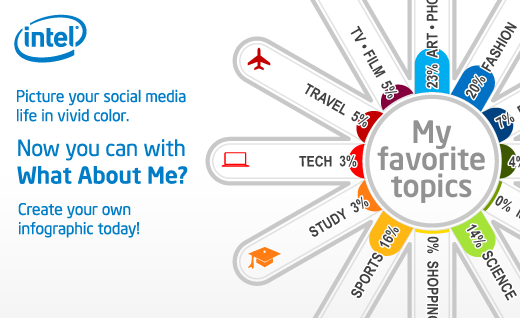 Create a snapshot of your social media life by visiting this link http://bit.ly/JNQUwk to create your own infographic. Then share your results and how you use social media during the Twitter Party. Prizes are: Five (5) $50 Best Buy gift cards and (1) $250 Best Buy gift card will be randomly awarded. To qualify for the prizes please follow 3 steps: (1) please RSVP here (link will be added TBD) , (2) tweet out your What About Me? image with the hashtag #Intelsocialbutterfly and (3) participate in the Twitter Party. For details and contest rules visit Little Tech Girl and TechMamas (click to bottom of this post link for contest rules). Social Butterfly Twitter Sweepstakes (“Promotion”) begins May 17, 2011 at 12:00:01 a.m. U.S. Pacific Time (“PST”) and ends May 17, 2011 at 11:59:59 p.m. PST (“Promotion Period”). The Promotion sponsored by Intel Corporation (“Sponsor”) and administered by CMD is open only to legal residents of the fifty (50) United States and District of Columbia who are at least eighteen (18) years of age and have reached the age of majority in their home states at the time of entry. Void outside the United States, in Puerto Rico and where taxed, restricted, or prohibited by law. 2. Prizing Prizes: One (1) of five (5) Best Buy gift cards valued at $50.00 USD and one (1) Best Buy gift card valued at $250.00 USD. Total Approximate Retail Value of all prizes: $500.00 USD. The Sponsor will choose six (6) winners (subject to verification) from a random drawing of all eligible entries appropriately received. Such drawings will occur same week as the end of the Promotion. date indicated thereupon in order to claim his or her prize. If the potential winner cannot be contacted, fails to sign and return the Affidavit of Eligibility, Liability and Publicity Release within the required time period, or if (for any prize) the prize is returned as undelivered, potential winner forfeits such prize and an alternate winner will be selected. Promotion open to all legal residents of the fifty (50) United States and the District of Columbia who are at least eighteen (18) years of age and have reached the age of majority in their home state at the time of entry. Void outside the United States, in Puerto Rico and where taxed, restricted, or prohibited by law. Employees, officers, and directors of Intel Corporation (Sponsor) and CMD, their respective partners, agencies, related companies, and agents, as well as the immediate family (defined as parents, spouse, children, siblings, and grandparents), and same household members of each such employee, officer, and director are not eligible to enter. All applicable federal, state, and local laws and regulations apply. By participating, you agree to abide by these Official Rules and the decisions of Sponsor, which are final and binding in all respects. Sponsor’s computer is the official clock for purposes of the Promotion. Sponsor reserves the right to cancel or modify the Promotion if fraud, technical failures, or any other factor beyond its control impairs the integrity of the Promotion, as determined by Sponsor in its sole discretion. In such event, Sponsor will select the winners via random drawing comprised of all eligible entries received prior to (and/or after, if appropriate) the action taken by Sponsor or by some other means deemed by Sponsor in its sole discretion to be fair, appropriate, and consistent with the spirit of these Official Rules. Sponsor reserves the right, in its sole discretion, to disqualify any individual it finds to be tampering with the entry process or the operation of this Promotion or to be acting in violation of these Official Rules or in a disruptive manner. Tampering includes but is not limited to the submission of Entry that is not solely and completely the original work of individual submitting same. Any attempt by any person to deliberately damage Sponsor’s or any related website or undermine the legitimate operation of this Promotion may be a violation of criminal and civil laws and, should such an attempt be made, Sponsor reserves the right to seek damages from any such person to the fullest extent permitted by law (as well as disqualifying such individual, if appropriate). Sponsor’s failure to enforce any term of these Official Rules shall not constitute a waiver of that provision. These Official Rules (or any other promotional materials) may not be published elsewhere without the express written consent of Sponsor, which may be withheld for any reason. By entering the Promotion and, if applicable, receipt of any prize, each entrant and, as applicable, winner agrees to release and hold harmless Sponsor, its partners and agencies (including but not limited to Intel Corporation and CMD), their respective related companies, and each of their respective officers, directors, employees, and agents, from and against any claim or cause of action arising out of participation in the Promotion or any Promotion-related activity, or from the receipt or use or misuse of any prize or from merchandise delivery, from claims based on publicity rights, defamation, invasion of privacy, copyright infringement, trademark infringement, or any other intellectual property or personal rights related cause of action. content/story submitted therewith, if appropriate); or (6) any injury or damage to persons or property, including but not limited to an individual’s computer (or any information/materials stored thereon), which may be caused, directly or indirectly, in whole or in part, by participation in the Promotion or from downloading any material from Sponsor’s or related website(s), regardless of whether the material was prepared by Sponsor, agency, or a third party, and regardless of whether the material is connected to a Sponsor’s or agency’s website by a hypertext link. Except where prohibited by law, you agree that: (1) any and all disputes, claims and causes of action arising out of or connected with this Sweepstakes or any prize awarded shall be resolved individually, without resort to any form of class action, and exclusively by state or federal courts situated in the state of Delaware, (2) any and all claims, judgments and awards shall be limited to actual out-of-pocket costs incurred, but in no event attorneys’ fees; and (3) no punitive, incidental, special, consequential or other damages, including without limitation lost profits may be awarded (collectively, “Special Damages”), and (4) you hereby waive all rights to claim Special Damages and all rights to have such damages multiplied or increased. Delaware law (with the sole exception of the choice of law/conflict of law rules of Delaware or of any other jurisdiction) governs the Sweepstakes and all aspects related thereto including construction, validity, interpretation, and enforceability of these Official Rules. By participating in Sweepstakes, you agree to submit to the personal and exclusive jurisdiction of the courts located in Delaware. 10. Winners List: For the winners list, send an email with Subject Line: “Social Butterfly Twitter Sweepstakes Winners List Request,” to pmay@cmdagency.com. Or, for a copy of the winners list, mail a self-addressed stamped envelope to Social Butterfly Twitter Sweepstakes Winners List Request, 1631 Thurman Street, Portland, OR 97209. Requests must be received by June 1, 2012.